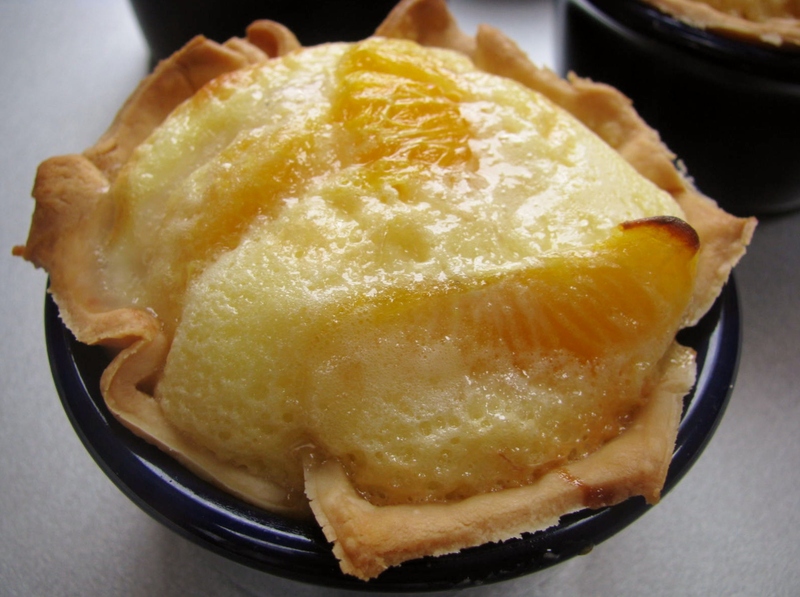 This is a French recipe for Fresh Fruit Tarts. 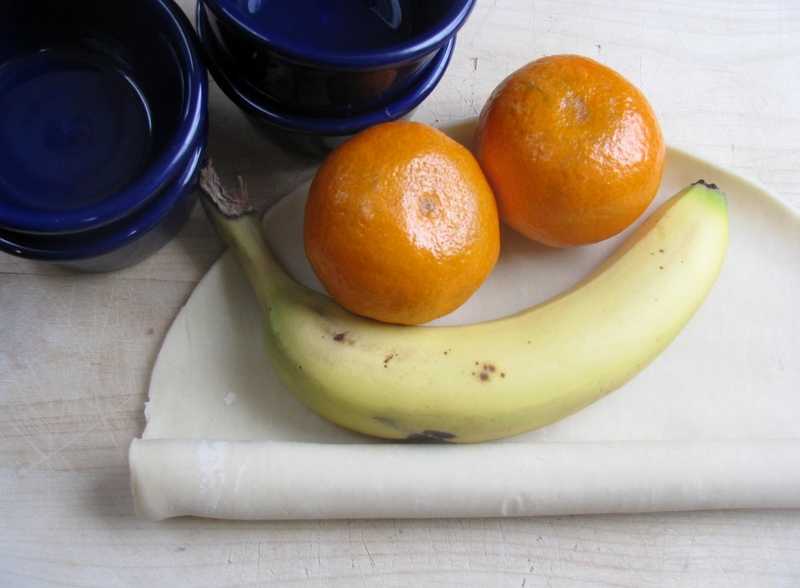 Use any fresh fruit or combinations of fresh fruit that you like. Berries work well. 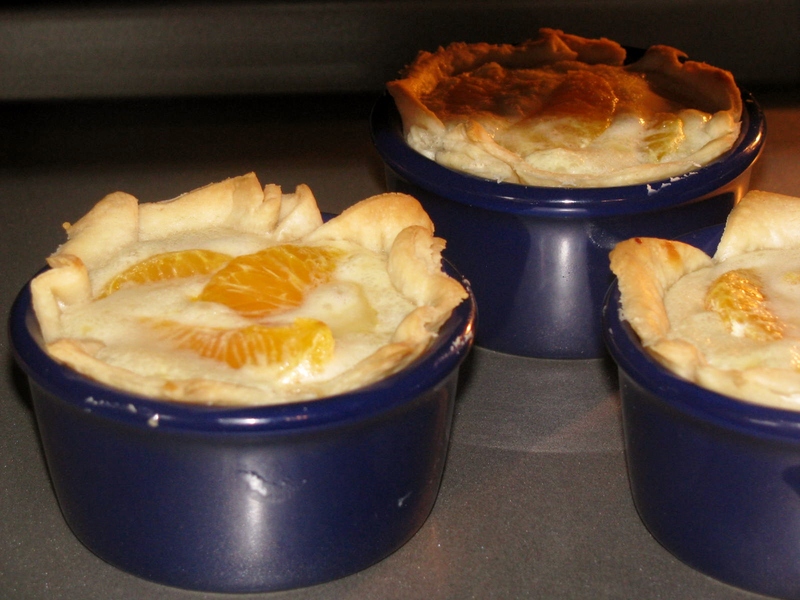 I didn’t have berries today and was in the mood for a Tarte aux Fruits Frais, so I improvised with a banana and two Cuties Clementines. 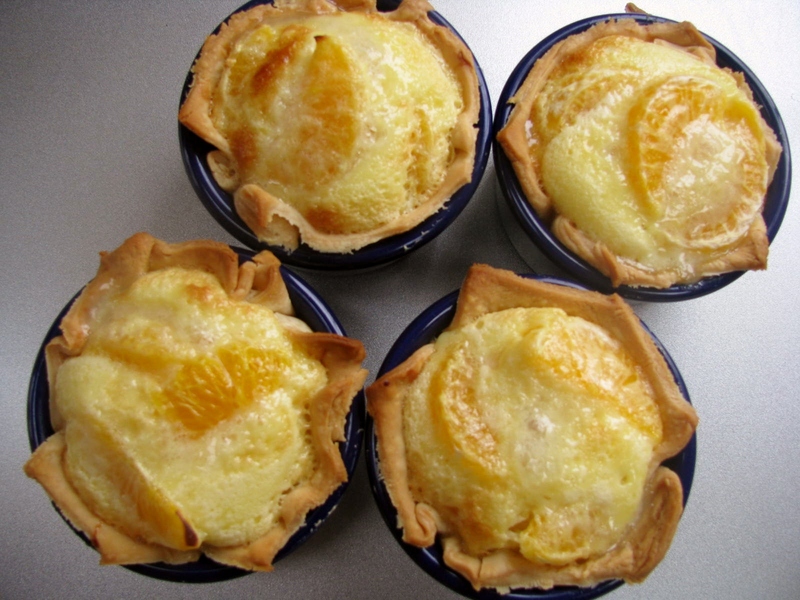 Grease 4 tart cups or ramekins with butter. You can never use too much butter. 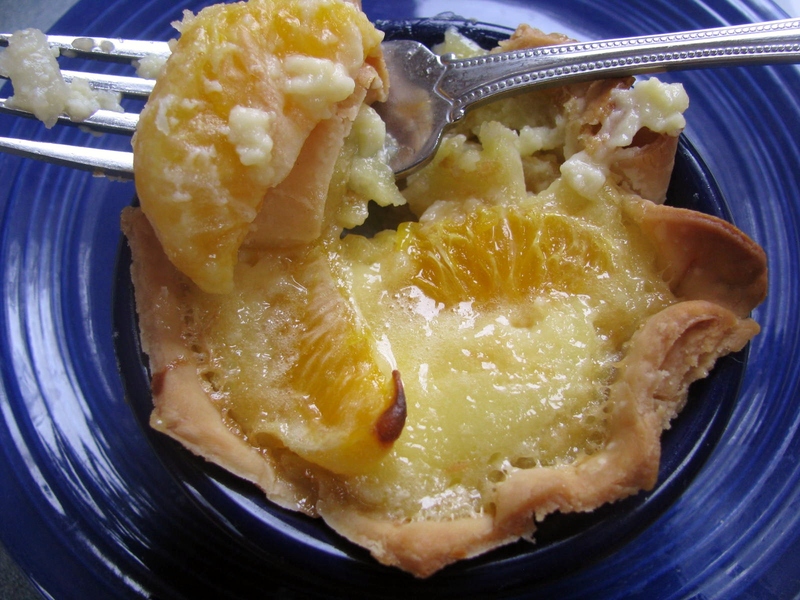 Your crust will be flaky and taste buttery. 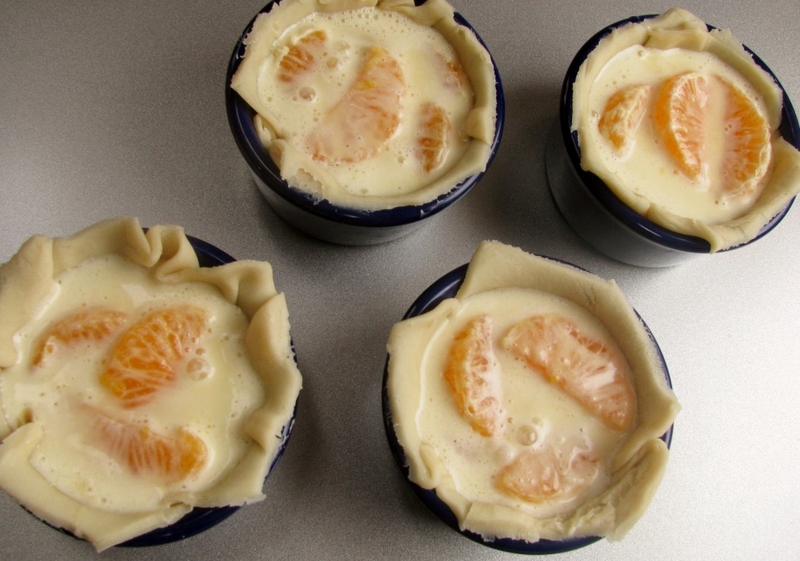 Cut the pie crust into quarters. 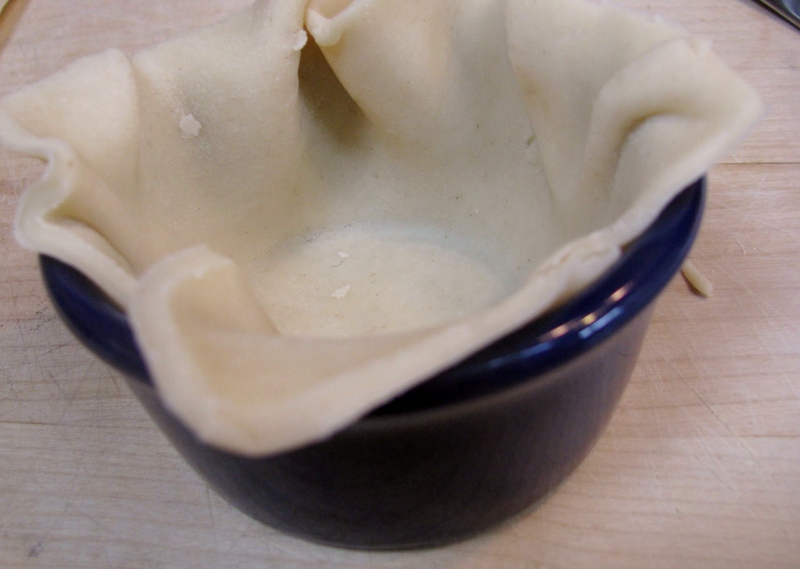 Or if you’re making homemade crust, roll out four circles to fit in your tart cups or ramekins. 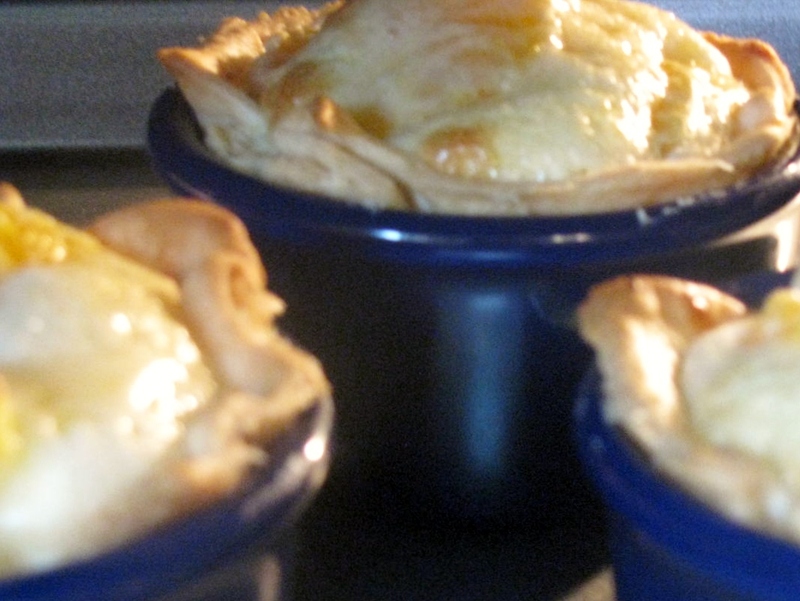 Line each ramekin with a crust. Trim off excess edges. Berries can go in whole, but larger fruit needs to be cut into bite-sized pieces. Any tough skin should be removed. 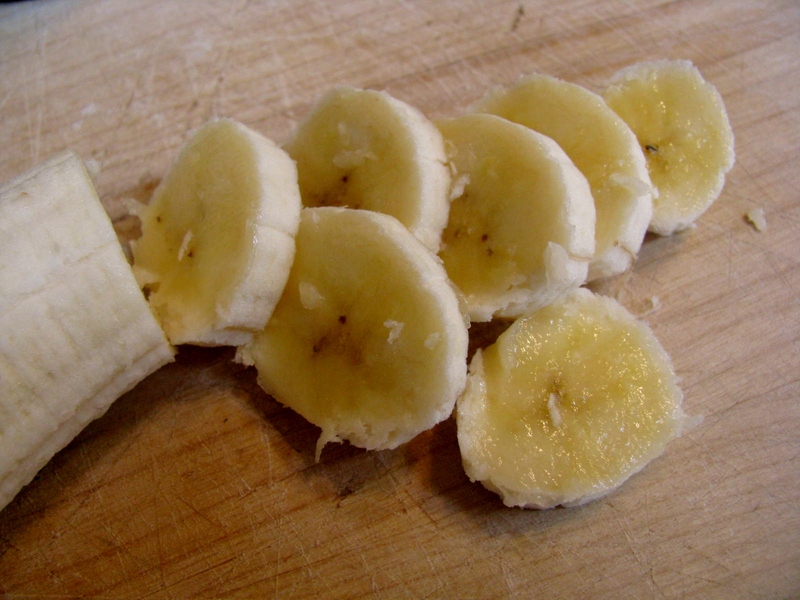 If you use apples, cut very thin slices. 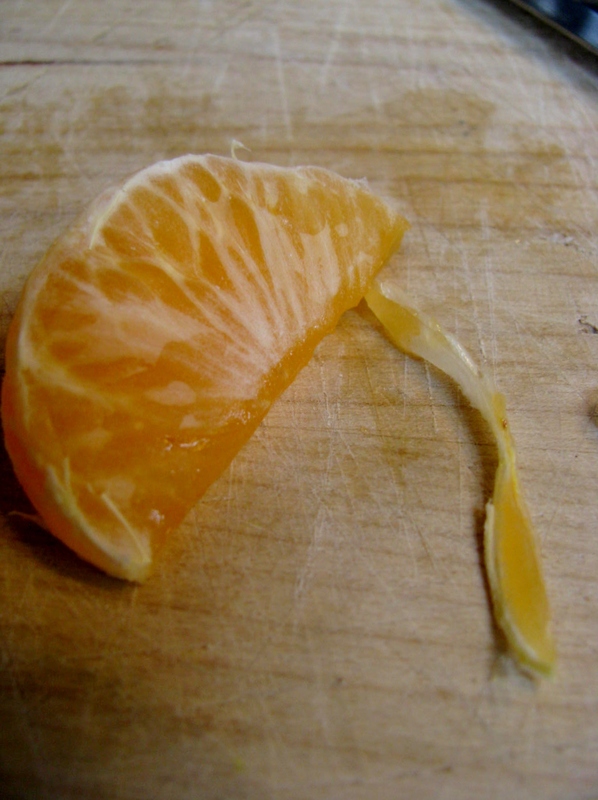 For oranges or other citrus fruit, remove the membranes. 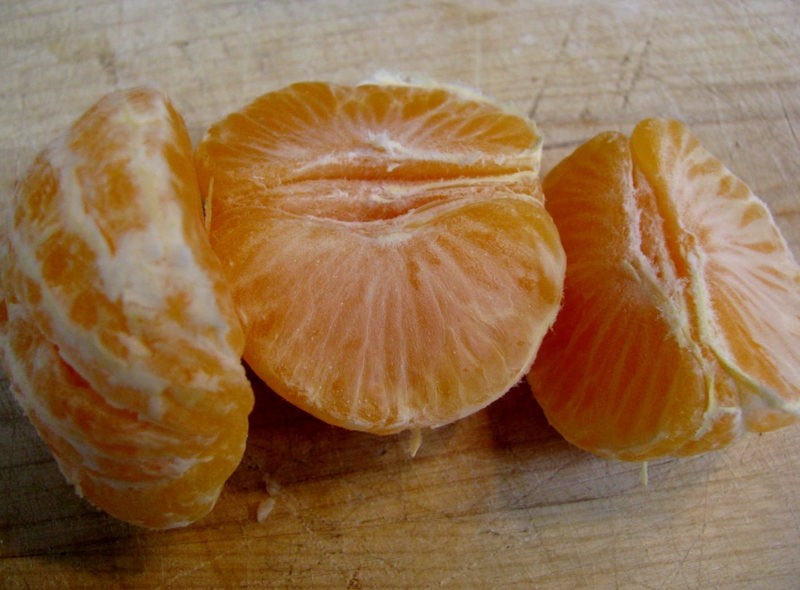 I had about 5 slices of banana and 5 segments of clementines in each cup. Arrange fresh fruit in cups until they are about 3/4 full. In a small bowl, mix cream, sugar, vanilla and 1 egg until completely blended. 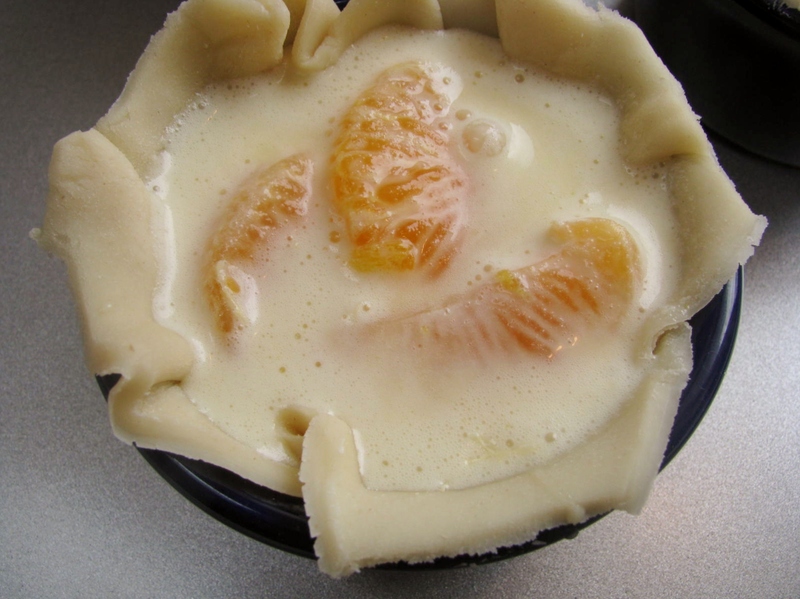 Pour cream mixture over fruit and bake. 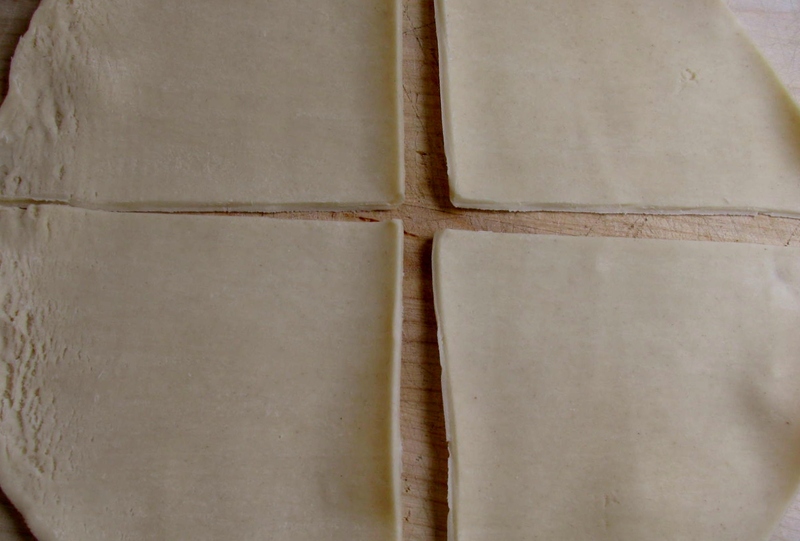 Here they are, in the oven, beginning to turn gold around the edges. Almost finished. Puffy and golden. 1/2 teaspoon Vanilla if you like this flavor. Otherwise, you may omit it. 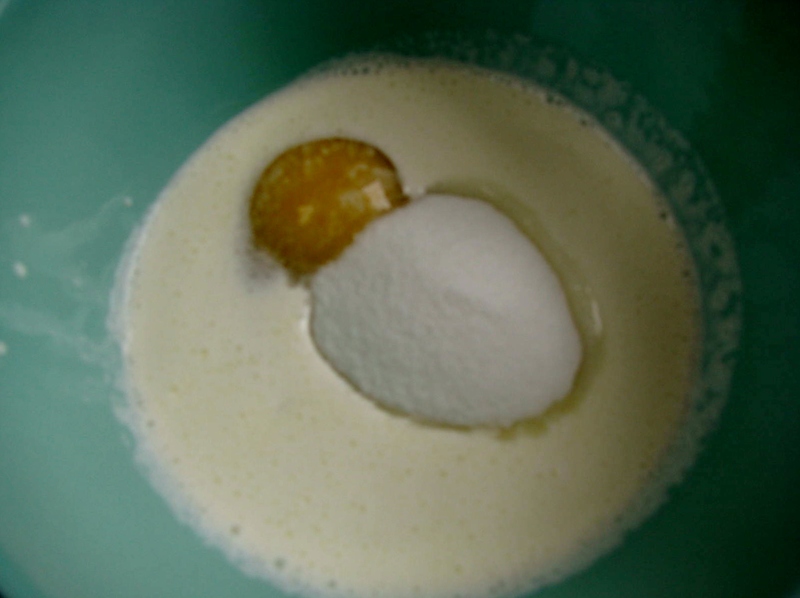 In a small bowl, mix cream, sugar, vanilla and egg until well blended. Pour 1/4 of liquid over fruit into each cup. Bake for 25 minutes. Enjoy! Bon appétit!